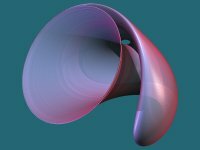 Basic physics and chaos theory, including fractal graphics, are the main topics of this site, intended for high school AP and undergraduate students and teachers. Dynamical systems analysis, underwater video and speculation on the nature of the universe are other interests of mine that show up here. For several years I operated a sales and consulting business through a commercial web site under the name M. Casco Associates. On entering my eighth decade I retired and thought about just closing down the site, but there are still folks accessing my online material so to continue to make that material available... here we go with my first personal website. Since this is a total overhaul of the original web site there will be some unavoidable link breakage. Please seek out your favorite pages and renew your bookmarks. The appearance of the pages will change some as I continue to update to this new style throughout the site. One advantage in running a personal website is that it makes me feel more free to indulge in personal opinion and observations. An example is the "Wonder!" logo that appears on this site. I have reached the age where I think I should be dispensing advice. To wonder about things is what I want my grandchildren to do. Wonder is an endless source of entertainment and appreciation of the miracles of everyday life. Because of my capacity for wonder, I do not know what it is to be bored. I recommend working on your own capacity to wonder. I have always been a curious fellow, in both senses of that adjective. My strong interest in the world around me and how it works, together with a sort of flypaper memory has made me seem a bit odd to those who know me best. Be that as it may, here you will find a few tools to help you explore certain aspects of the world, as well as bits of advice. Also there is a separate section called "observations" where I share some ideas perhaps not fully formed - just stuff that I am, following my own advice, still wondering about. If you need something to wonder about, take a look. Navigating this site begins with the column of buttons at the left. The "home" button is linked to this page. The "observations" button leads to pages where I sort of think out loud about things that have bubbled to the top of my consciousness. I intend to write something new here fairly often. The Connections button brings up a series of pages that comprise a fictionalized account of the family's genealogy from 1640 to 1940 overlapping 3 decades of the diary entries from Alice's Diary. The "Alice's Diary" button takes you to an area of the site,provided mainly for the benefit of friends and family, containing Gram Jones' diary entries covering many of the years 1909-1966. Anyone who is curious about life in the U.S. during the first 2/3 of the twentieth century is welcome to scan these pages. The "physics" button links a not for credit, introductory course in basic physics as well as some more advanced ideas on the topic. The "chaos theory" button accesses pages that address that topic, some of which are at the level of a good high school student. 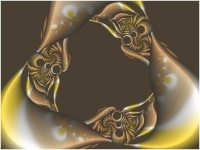 The "chaotic art" button links to several pages of mathematically generated images of things called fractals. The "nautic video" button goes to my marine biology pages - one of those aspects of the world around me that I have been paying attention to. The "answers" button leads to a selection of technical questions and answers that have come up in the course my work. The "about" button takes you to a page where I provide some of my background and contact information. I recently became aware of a page on the IEEE website that accumulates articles from various sources. If you wonder about things scientific you should check out the C4R page. Thanks for visiting. I hope you may find the material available here interesting or even useful. Please request permission to reproduce or otherwise use this material. Normally permission is promptly granted. I have no need to profit from the use of this material but I am curious about the uses to which it might be put. I would like to acknowledge help that I have received in preparing this web site. Steve's Templates saved me a lot of work at no expense. See the link at the bottom of this page for the website. Also HTML-Kit provided a free HTML editor that I found very useful. Web site contents © Copyright James D. Jones 2011-2016, All rights reserved.